Our 2018 NHL Draft Black Book is under a month away from being released. Our goal is to release it the week after the NHL Combine. 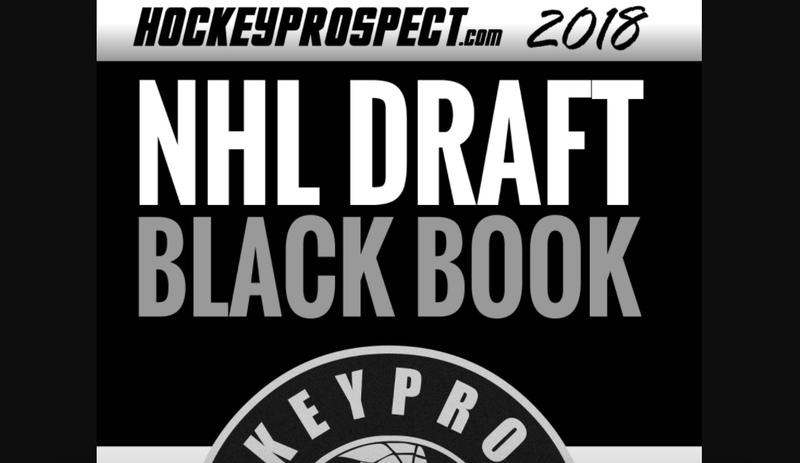 Unlike previous years, we will only be creating one version of our NHL Draft Black Book this year. 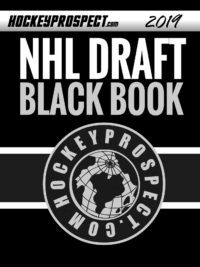 Our other NHL Draft publication will be a new version of our old NHL Draft Guide. The Black Book will closely resemble the previous ‘team editions’ of our Black Books. Our NHL Draft Guide will only include our 2018 NHL Draft year profiles and ranking. Check back closer to the release date for more details on both publications. In the meantime, here is a sample profile that is included in this years publications. Both publications will include over 300 player profiles for the 2018 NHL Draft. 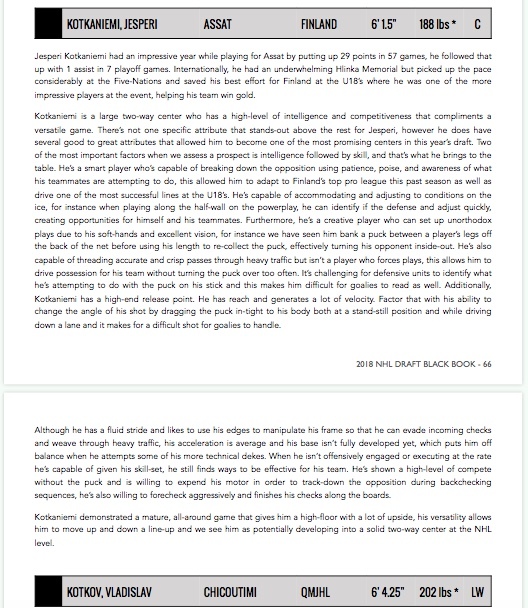 Jesperi Kotkaniemi had an impressive year while playing for Assat by putting up 29 points in 57 games, he followed that up with 1 assist in 7 playoff games. 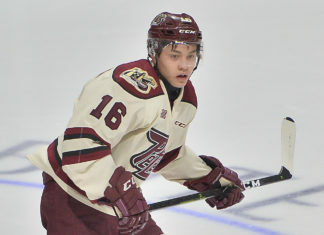 Internationally, he had an underwhelming Hlinka Memorial but picked up the pace considerably at the Five-Nations and saved his best effort for Finland at the U18’s where he was one of the more impressive players at the event, helping his team win gold. Kotkaniemi is a big two-way center who has a high-level of intelligence and competitiveness that compliments a versatile game. 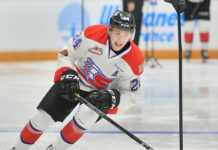 There’s not one specific attribute that stands-out above the rest for Jesperi, however he does have several good to great attributes that allowed him to become one of the most promising centers in this year’s draft. 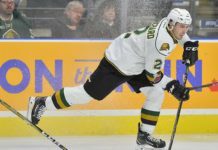 Two of the most important factors when we assess a prospect is intelligence followed by skill, and that’s what he brings to the table. He’s a smart player who’s capable of breaking down the opposition using patience, poise, and awareness of what his teammates are attempting to do, this allowed him to adapt to Finland’s top pro league this past season as well as drive one of the most successful lines at the U18’s. He’s capable of accommodating and adjusting to conditions on the ice, for instance when playing along the half-wall on the powerplay, he can identify the defense and adjust quickly, creating opportunities for himself and his teammates. Furthermore, he’s a creative player who can set up unorthodox plays due to his soft-hands and excellent vision, for instance we have seen him bank a puck between a player’s legs off the back of the net before using his length to re-collect the puck, effectively turning his opponent inside-out. He’s also capable of threading accurate and crisp passes through heavy traffic but isn’t a player who forces plays, this allows him to drive possession for his team without turning the puck over too often. It’s challenging for defensive units to identify what he’s attempting to do with the puck on his stick and this makes him difficult for goalies to read as well. Additionally, Kotkaniemi has a high-end release point. He has reach and generates a lot of velocity. Factor that with his ability to change the angle of his shot by dragging the puck in-tight to his body both at a stand-still position and while driving down a lane and it makes for a difficult shot for goalies to handle. Although he has a fluid stride and likes to use his edges to manipulate his frame so that he can evade incoming checks and weave through heavy traffic, his acceleration is average and his base isn’t fully developed yet, which puts him off balance when he attempts some of his more technical dekes. When he isn’t offensively engaged or executing at the rate he’s capable of given his skill-set, he still finds ways to be effective for his team. He’s shown a high-level of compete without the puck and is willing to expend his motor in order to track-down the opposition during backchecking sequences, he’s also willing to forecheck aggressively and finishes his checks along the boards. Kotkaniemi demonstrated a mature, all-around game that gives him a high-floor with a lot of upside, his versatility allows him to move up and down a line-up and we see him as potentially developing into a solid two-way center at the NHL level. 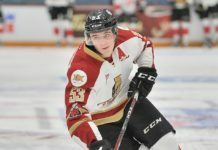 Next article2018 QMJHL Draft Guide Now Available!